As Black History Month came to a close, two news items prove that the legacy of slavery in America is far from over. The first was former presidential candidate, the Rev. Al SharptonÃ¢Â€Â™s, revelation that one of his ancestors was owned by a relative of late South Carolina Senator and segregationist Strom Thurmond. Professional genealogists working for Ancestry.com found that SharptonÃ¢Â€Â™s great-grandfather, Coleman Sharpton, was a slave owned by Julia Thurmond, whose grandfather was Strom ThurmondÃ¢Â€Â™s great-great-grandfather. Coleman Sharpton was later freed. In the second report, a geneaologist claims that an ancestor of current presidential hopeful Barack ObamaÃ¢Â€Â™s white mother owned slaves. According to the research, one of ObamaÃ¢Â€Â™s great-great-great-great grandfathers, George Washington Overall, owned two slaves who were recorded in the 1850 Census in Nelson County, Ky. The same records show that one of ObamaÃ¢Â€Â™s great-great-great-great-great-grandmothers, Mary Duvall, also owned two slaves. None of this should be a surprise to anyone. If your ancestors were in the United States before 1860, then it is highly likely that their lives were touched by the peculiar institution in one way or another. So why is this such a big deal? Slavery was an integral part of American life for over 200 years. Southern businessmen owned slaves. Northern insurance companies insured that human property. 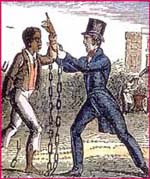 Slave labor and the capital derived from it made this country what it is today. For example, I donÃ¢Â€Â™t know the exact details of my own heritage, but from oral histories handed down through the family, I understand that I have African, Cherokee, Blackfoot, Irish, German and who knows what other shade of blood in my veins. The same is true of most Americans – white and black – who have at least one parent whose family has been on the continent for a while. It will be most interesting to watch how this history is wielded on the political battlefield. Obama is already facing criticism that he isnÃ¢Â€Â™t Black. Does the fact that his motherÃ¢Â€Â™s family was holding the whip rather than suffering the lash provide ammunition for critics who deny Obama his part in the Black American experience? How will the Sharpton/Thurmond connection affect the Reverend AlÃ¢Â€Â™s decision to make another run at the White House? The media is reporting these incidents as if there should be some embarrassment for either Obama or Sharpton over this. If anything America as a whole should be embarrassed by its own history. From the newspapers that supported the institution to the companies that profited from its unpaid labor force. And if the United States is truly humiliated by its mistreatment of our African ancestors, then it should pay reparations to the Black folks who still have to deal with the nationÃ¢Â€Â™s racist past and present. His motherÃ¢Â€Â™s family profited in its ownership of Africans, but his Black skin is the primary issue he will face in his presidential bid. Is he a beneficiary or a victim of slaveryÃ¢Â€Â™s legacy? Or is he both?